James is known for his work both as a performer and producer/recording engineer. In performance, he plays a multitude of stringed instruments with an emphasis on fiddling. He has an abiding interest in traditional forms and styles of various ethnic origins, but also works extensively with singer-songwriters and was the principal songwriter in critically acclaimed pop/roots band “Fat Man Waving”. James can presently be found performing with traditionally influenced groups such as The Brian Pickell Band, Finest Kind, Ecosse (Bobby Watt, Duncan Gillis and Rob Graves), renowned clawhammer banjo player Ken Perlman, whistle player/composer Frank Cassidy (The McGee Band), JIIG (James, Ian Robb, Ian Clark, Greg Brown) whose self-titled CD won Ian Robb best traditional singer of 2005 at the Canadian Folk Music Awards (CFMA’s) and newly formed fiddle collective EH! , a collaboration with fiddler Anne Lederman and fiddler/pianist Emilyn Stam that attempts to balance the traditional with the newly composed. James also performs regularly with singer/songwriter Ian Tamblyn as well as the duo, Healy and Juravich. James has co-produced and engineered recordings with all of these musicians as well as such others as Pierre Schryer (the album “Blue Drag, co-produced and engineered by James, was nominated for a 2004 Juno Award and who’s 2008 release “Mélange” was nominated for a 2008 CFMA), Ian Tamblyn, Dermot Byrne, Shelley Posen, Nicholas Williams, Lynn Miles (2003 Juno winner), Chris White, Genticorum, Tena Palmer and Emory Lester and Slavik Hanslik, Laura Smith , Denis Lanctot, Debbie Quigley and Martin Gould, Willie P. Bennet, Kyle and Jake Charron, Danny O’Connell, Frida’s Brow(nominated for best vocal group in the 2008 CFMA’s), Matt Pepin, Bob Carty, Crowfoot, Neil MacDaniel(nominated for a 2008East Coast Music Award) and many others. In addition to performing and production, James has taught at numerous music camps across Canada and some in the US. He is presently involved in a Canada Council funded mentoring, teaching, and recording process in Smithers, BC known as the “Truffles” project. 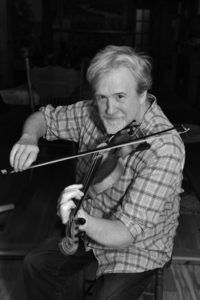 This project was co-created by well known fiddle innovator and composer, Oliver Schroer and the local fiddle ensemble, The Valley Youth Fiddlers.